A $6500 Cell Phone? How About an $8 Million Cell Phone? Kurt tells me I should clarify my statement about shopping. He says I must come clean to my readers that although I hate shopping for clothes, makeup, hair stuff, groceries, household goods etc., that I actually have two weaknesses: office supplies, and shoes. But not shoes in the typical sense of girlie shopping. I will never do a double-take at a pair of designer heels, but if you give me a sensible pair of sandals or a nice arch support tekkie, I will buy three or four of each and stock the closet. And, much to Kurt’s dismay (which is why he insists I confess to you) I will wear those shoes until the straps are falling off and they have more holes than a prairie dog town. But that won’t stop me from purchasing more before those are worn out. After all, we must have socially acceptable footwear as well. And let’s not get me started on my obsession with gadgets, pens and stationery from the office store. Why am I telling you about my weakness for comfortable shoes and office supplies? Because we all have our “bling” things, don’t we? As much as we try to be frugal, we each usually have something that just might make us spend more than our budget, or have the occasional “splurge.” I will be the first to tell you I have paid $5 for a delicious salted caramel mocha from Starbucks, and I can’t deny that our recent 20th anniversary trip was more than I could have ever imagined spending in my life. And isn’t anything that we consider expensive, or splurging, completely relative to our income and upbringing? When I was growing up, I always got so excited to collect coal from the train tracks and even poach it occasionally from the strip mines, because my grandpa would give us pennies to bring him pieces of coal for his furnace. I would then blow it on penny candy such as Swedish fish. And in high school I remember fighting with my mom about my yearly clothing budget for school. I wanted to spend all my pants money on one pair of Michael Jackson vinyl pants (yes, okay I apparently had some affinity for style, even if it wasn’t normal) instead of the three pair of generic blue jeans she wanted to buy me from the local country store in Gypsy, Pennsylvania. 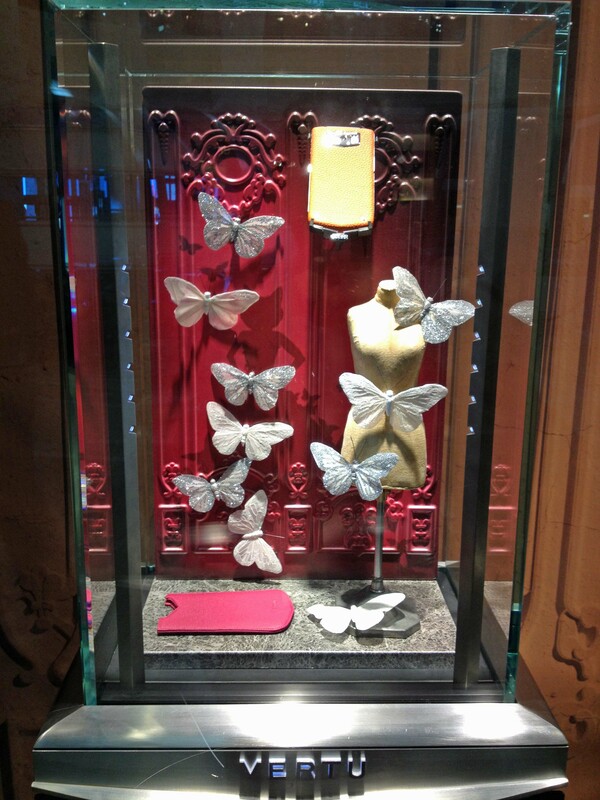 No amount of butterflies could make me purchase the most expensive cell phone in the world. When I was in my twenties, Kurt and I often struggled to meet our monthly bills, especially with the financial drain of our failing magazine. I remember getting that nauseous feeling in the pit of my stomach regularly when I would consider purchasing something beyond our budget. I would get nauseous any time our bank account was less than $100, because we could usually cover any emergency expenditure or anything forgotten to log in the bank register, for $100. Fast forward twenty years and that fear applies to a bank account under $1000. Now if I forget something in the register, it may be as serious as a large sum: student loan payment, mortgage, withdrawal to pay the monthly salary of our housekeeper. And I know I’m lucky. There are many people who never reach a level that even gets their comfort zone to that $100 from our twenties. 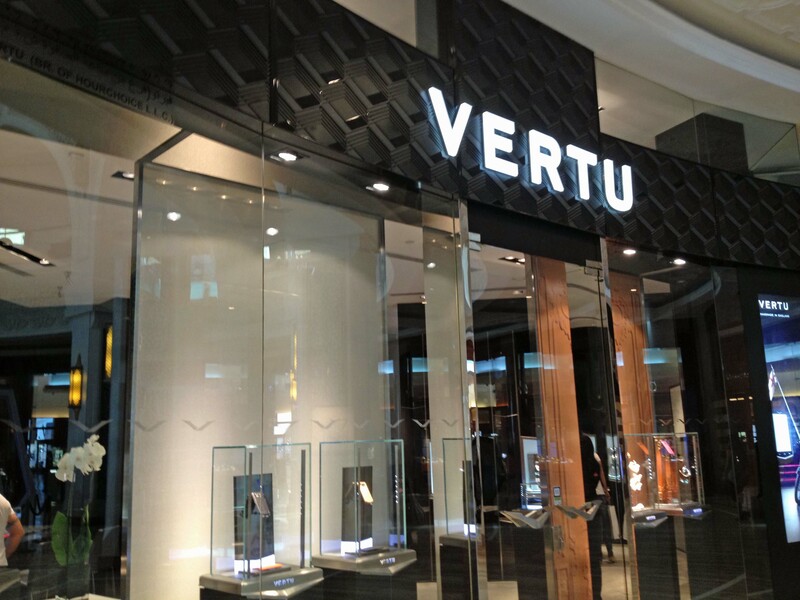 So when I saw the Vertu store in the Dubai Mall, with each cell phone basking in the glow of a case usually reserved for luxury jewelry, I felt that sick feeling in the pit of my stomach. Even being near a “frivolous” item so expensive made me nervous, as though it would drain my bank account simply by looking at it. 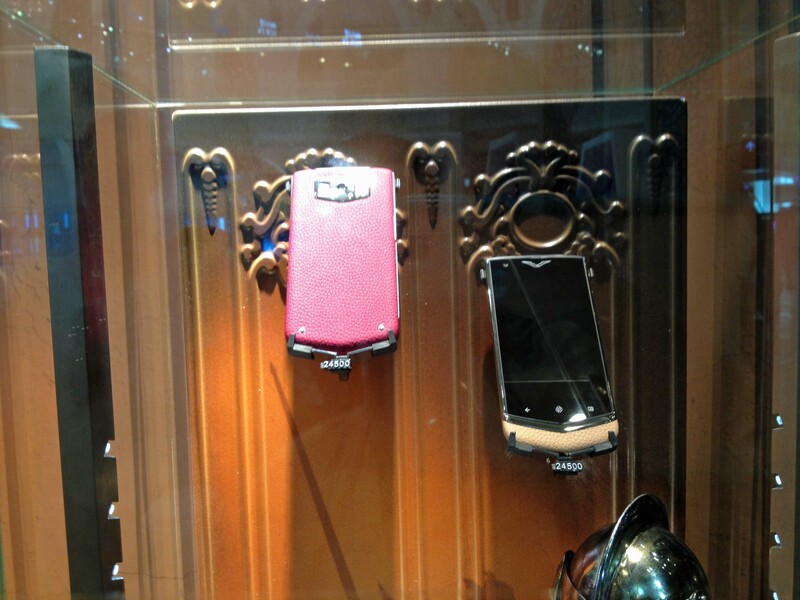 The price tags on most of the display case phones were around 24,500 Dirhams, or $6500. $6500? Seriously? Was this phone going to wipe my arse? There was no difference in function of the phones. They were simply expensive because they were made of expensive leather, and Swarovski crystals, and mainly because there is a demand for phones us average yokels cannot afford to buy. They are yet one more symbol of a class intent on making sure every accessory is inaccessible by few others than within their own financial class. To be perfectly honest, I wouldn’t want to own one. If you read my earlier post about shopping, you know I have a weakness for gadgets, but my weakness is still function, not style. I tried to think of a way to look at owning such an expensive phone. Maybe people who own these phones think of it in the same way as jewelry, or a designer purse, or those fancy dress shoes whose designer names I can never pronounce. Could I relate to it that way? No, I guess not. I own a few pieces of expensive jewelry that I inherited but rarely wear. I wouldn’t part with them because they are sentimental. But when I think of spending thousands of dollars on a piece of jewelry, I get that nausea again. In this regard, I am thoroughly my mother’s daughter. When that kind of money is involved, I think of everything else it could purchase. $6500 could purchase a new, small car or a larger used one. $6500 could pay for one semester at a community college. $6500 could be the downpayment on a nice, small-town house in America, or purchase an entire house in a low income section of South Africa. $6500 is less than a year’s salary for the average domestic worker in South Africa. $6500 could provide clean water for 260 people…for life. So how about a cell phone with a price tag of $600,000? $1 million? $8 million? When I went online to confirm if I really saw something as insane as a $6500 cell phone, I found that as far as bling cell phones go, $6500 is actually “modest.” Check out these Top 10 Most Expensive Mobile Phones from a list compiled last year. They range from $49,000 to, yes indeedy, $8 million. I won’t begin to break down all the lives that amount of money could change. Yes, it’s all relative, and I guess that’s the point. When it comes to those amounts, I just can’t relate. I don’t know about you, but listing all those things $6500 could do made me have to do something to feel better about this insane world, so I am donating $25 to water.org to give one person water…for life. Please feel free to join me. Maybe 260 of us could change the lives of 260 of the people who don’t even know a $6500 cell phone exists, let alone imagine buying one. My bling thing? Maybe shoes, but they aren’t that expensive ($250 is my top for good boots), I am a bargain shopper. When 85 people own more than 80% of the worlds wealth, the price on these things makes sense, doesn’t it? $6,500 that someone will spent THIS YEAR for a phone. Next year, it will be tossed for a new one. Now think of the good that can be done… Makes you sick, doesn’t it? A Winter Break From the Freezing Northeast: Saguaro National Park!